What could be considered one of the most unique entries from the ’70s explosion of British horror cinema came roaring into theaters in 1973, the tale of Psychomania details a biker gang who use black magic to live up to their club name, truly becoming “The Living Dead”. Replacing the zombie’s typical lumbering gait with stunt-laden motorcycle riding, there’s no decomposing bodies or mindless cravings for human flesh in this film, rather the antiheroes have been simply stripped of any societal mores that they once had. And while his sculptural creations are certainly more of a grotesquerie than these cinematic counterparts, one can’t help but see a similarity in concept between them and Hugh Rose’s Roadkill Motorcycle Club. Months after the closure of his native Guernsey‘s Centre Fold Gallery, the physical space operated by the Readerswives Collective that he was part of, artist Hugh Rose’s talent for decorating walls under the guise of Dred One was first turned towards hand-painting vinyl designer toy forms. And the result of this experiment was April of 2010’s Zombie Biker, a starkly composed black definition against the white base of a Kidrobot-produced 4-inch tall Munny sculpture. While not technically part of Rose’s soon-to-be-introduced Roadkill Motorcycle Club series, this piece revealed that the artist already had an affinity for depicting undead bikers, a theme he’d revisit before the end of that year. Commissioned by fellow artist Matt A* to hand-paint a 7-inch tall Munny, Rose’s completed work was delivered in early September of 2010 and was simply titled Roadkill Motorcycle Club, which he’d later refer to as R.K.M.C Member and Roadkill Motorcycle Club Biker. Embracing Rose’s penchants for typographical complexity, ornate detailing, and stunningly executed near-symmetrical designs, this piece’s appearance was mimicked that same month by the artist’s submission to the 1st Annual Custom Toy Union Battle Bracket, having a victorious first round against Matt A*’s Death from Above before being defeated by The Model Maker‘s Burton Dunny. With his contribution being titled R.K.M.C Prospect, though simply known at the time as Roadkill Motorcycle Club, this hand-decorated 3-inch tall Dunny form embraced the rabbit-like appearance of the vinyl sculpture, giving the piece a rodent-based skull and tail-adorned backside. And it was this animal-centric addition that would persist when Rose returned to the Roadkill Motorcycle Club in 2013, creating the muscular Roadkill M.C President owl and beefy RoadKill M.C Sergeant-At-Arms dog characters before once-again seemingly abandoning the concept. That is, until mid-2017 when he issued the Roadkill M.C Series through retail partner Martian Toys. 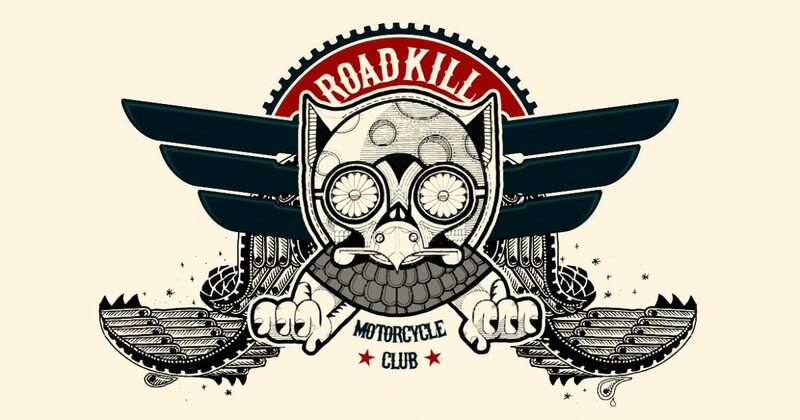 Known for haunting the road upon which they were killed, the Roadkill Motorcycle Club membership was expanded with three new members: the ursine Patch, the deer-like President, and the cottontailed Prospect. Each featuring hand-sculpted details over their 3-inch Dunny form bases, these Roadkill M.C Series pieces were painted with Rose’s typical acumen, the multiple copies created of Patch and Prospect having unique traits that ensured each of them was truly one-of-a-kind. And while it appears that Hugh Rose’s Roadkill Motorcycle Club have once again receeded into their graves, history has proven that it is only a matter of time before the artist resurrects them and the concept rises anew. Click Here to Acquire one or more of Hugh Rose’s Roadkill Motorcycle Club Works.